Acquisition History: In 1992, the Land Conservation Investment Program (LCIP) successfully completed the purchase of six lots in Franklin totaling 151 acres, including 1,660 feet of frontage on Webster Lake. Later that year, LCIP formally conveyed the property to the New Hampshire Fish and Game Department. 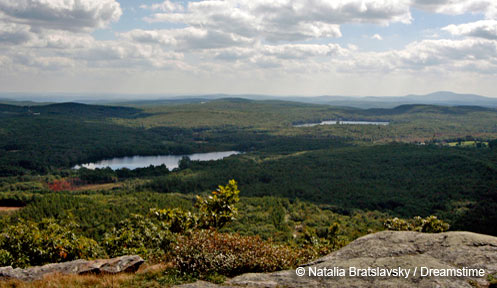 Description: In addition to the 1,660 feet of frontage along the predominantly developed shoreline of Webster Lake, the upland portion of the Webster Lake WMA is primarily made up of hemlock/hardwood/pine forest. Hardwoods include red oak, red maple, and beech. Approximately thirteen acres of a 17.5 acre wetland falls within the WMA along the southern border. A steep oak-pine dominated hill with rock outcrops dominates the eastern half of the property. Common Wildlife: Common wildlife species include white-tailed deer, turkey, and fisher. Wood ducks and mallards commonly use the wetland. Bald eagles frequent the shoreline on the WMA. Webster Lake is stocked by the NH Fish and Game Department with rainbow and brown trout. Typical warm water species occurring in the lake include smallmouth and largemouth bass, eastern chain pickerel, hornpout and white perch. Directions: Webster Lake WMA can be accessed from Lake Shore Drive off either NH Route 11 or NH Route 3A in Franklin. Although the property contains significant lake frontage, there is no boat or canoe access. The lakeshore is nearly 0.5 mile across the property from Lake Shore Drive. DeLorme NH Atlas and Gazetteer coordinates: Page 35, F 11.